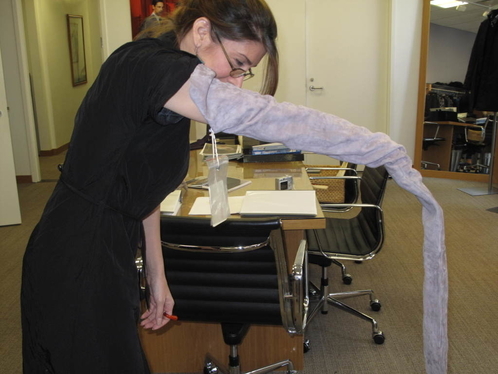 I’ve never forgotten the ultra-long gloves my designing friend Stacy Lomman and I saw at Brioni in 2010. At first I found them to be highlarious. Stacy thought they would be good for an elephant costume. But then she slowly and patiently put one on and it looked fabulous! I swear, I’ve been waiting for giant gloves to become A Thing ever since, and now my patience has been rewarded. Thank you to OG blogger Susie Bubble for alerting me to this look by Chen Peng Studio. This, of course, sent me down an Internet rabbit hole, on the hunt for other examples of giant glove love. Here’s a design from Walter Van Beirendonck’s menswear show for fall/winter 2017-2018. 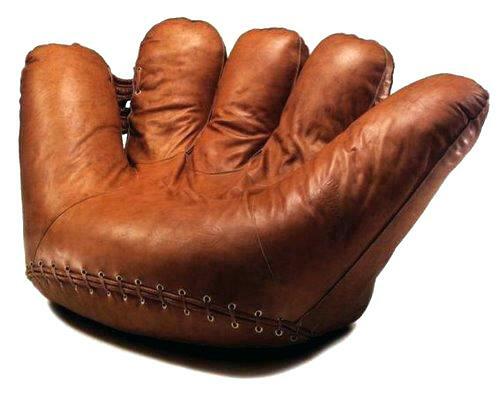 That, in turn, reminded me of the baseball mitt chairs that were a Thing in the 1970s and 1980s. A reissue of the original is available on GreatBigStuff.com, and I do need a new easy chair for the living room. Better start saving up!